Wyclef Jean performed at the one-year anniversary celebration of "Sounds of Little Haiti" Friday night as part of Haitian Heritage Month. 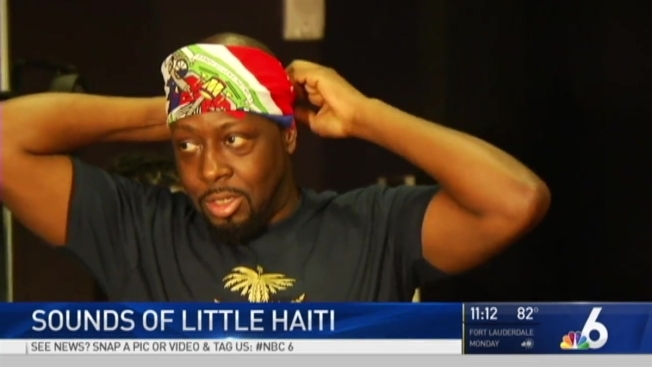 The former Fugees star said he had been wearing a similar bandanna when Los Angeles County sheriff's deputies stopped his car March 21 in West Hollywood, California, believing him to be an armed robbery suspect. Sheriff's officials later apologized and said deputies detained him in a patrol car "out of an abundance of caution." Jean said that along with his lawyers, his 12-year-old daughter has scrutinized the deputies' actions in light of other national news reports about black men detained or killed in altercations with police. He advised his daughter to do exactly as he did, following deputies' instructions. "I'm alive to say I didn't go for my waistband," he said. That's a lesson his daughter and other children need to be learning in schools, Jean said, in classes taught by police officers who regularly patrol in their communities. "When the police stop you, stay calm. Do not react in a violent manner. Do not raise your voice. Stay very alert," Jean said, wryly adding, "and the minute the cops stop you, start rolling the camera." Jean met with reporters Friday afternoon, hours before performing outside the Little Haiti Cultural Center. The evening's show was the first in a series of appearances Jean had scheduled this weekend in Miami, where the large Haitian-American community anxiously waits for the Trump Administration to decide whether to renew immigration benefits granted to Haitians after a 2010 earthquake struck their Caribbean homeland. Without "temporary protected status" allowing them to legally live and work in the U.S., roughly 50,000 Haitians will face deportation. Jean urged his fans to pressure lawmakers to support renewing the Haitians' benefits. James McCament, President Donald Trump's acting director of U.S. Citizenship and Immigration Services, has said Haiti is stable enough for its citizens to no longer need protection from deportation. According to emails obtained by The Associated Press, Trump appointees have sought evidence that Haitian immigrants have committed crimes. They apparently wanted the information before announcing whether the temporary protected status would continue. "There's a workforce of Haitians in every sector of business, and I don't think we should overlook that," Jean said. "We come to this country, we work hard, and we don't break the law." Jean praised new Haitian President Jovenel Moise, though he had campaigned for his opponent, but he cautioned that Moise's government wasn't prepared to have Trump break his campaign promise to be a "champion" for Haitians. "Haiti can't take 50,000 in right now," Jean said. "Whatever commitment was made to Little Haiti, this is a great way to start _ to say, you know what, we're going to give you all more time to get this country back."